Garage Sale For Christchurch was launched only a few days after the second major earthquake in Christchurch. The idea was pretty simple, get friends to list some of their un-wanted goods on Trade Me then donate the proceeds of the sale to the NZ Red Cross. Trade Me also agreed to refund any fees for proceeds donated with a proof of receipt. 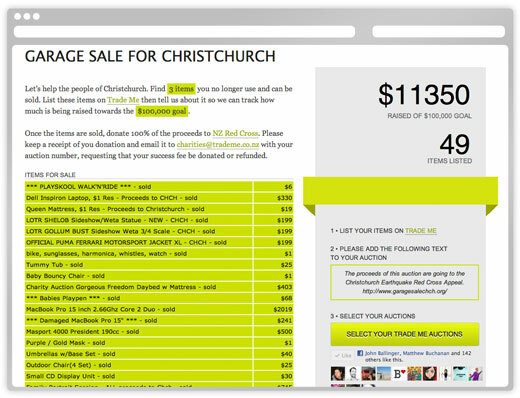 This application used Trade Me's new OAuth API to help users select which auction would be listed on the Garage Sale website.